A garage floor coating is almost a necessity for anyone who owns a garage, or at least ones that aren’t filled to the ceiling with spare furniture or old junk. That’s because these coatings not only make the floor look better but also protects the floor of the garage as well. Some of them not only are water-resistant but also resist the damaging effects of road salt that may fall off the vehicle. Before using one of these products, however, the user has to find the best garage floor coating possible. Which is an area I can be helpful. Below are some of the best garage floor coating products currently available. These are products that look good and will do a good job at protecting the floor of your garage. Suitable for a variety of different surfaces, including both indoor and outdoor masonry or concrete surfaces, this product can be used as a protective coating for any garage floor. Each gallon covers approximately 300-square feet of the surface if two coats are applied, and will dry to the touch in about 4-hours and will be suitable for foot traffic in approximately 24-hours. While it goes on milky, this coating will dry to a clear finish and will go a long way towards hiding stains and imperfections in the surface treated. When dry, this product provides resistance to both chemicals and UV rays. This kit not only contains the epoxy necessary to cover the floor of a garage but also contains all of the equipment needed to complete the job. Some of the things which can be found in this kit include gloves, brushes, a squeegee, etching solution, and flecks. When the product is applied to the floor and cures, it provides a surface that’s durable and is slip-resistant. The coating is also anti-microbial and should be a coating which protects the floor against chemicals and oil for many years. Since it contains everything needed to put a new coating on the floor, it’s an easy solution for people with limited time to shop for individual tools. Designed not only to improve the look of concrete but also to provide a protective coating against chemical spills and wear, this product is a good product for garage floors. 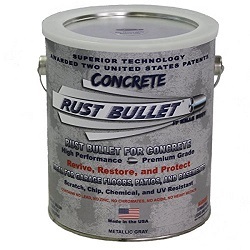 This 1-gallon container will coat approximately 300-square feet per coat cures quickly. Once dry, it creates a metallic gray coating that will protect it against oil, grease, various chemicals and make it not only moisture-resistant but also resistant to impacts and abrasions. It can also be used to coat surfaces other than garage floors including walking paths and other concrete surfaces. This water-based sealer is a good choice for use on unsealed and unpainted concrete and stone surfaces. It not only protects the surface that it coats but it also creates a beautiful wet look that doesn’t darken the surface the way other products darken. This low-odor formula goes on smoothly and dries in only a matter of a few hours. It can be sprayed, brushed or rolled onto the surface and provides professional level results each and every time. This product is made in the USA and is VOC compliant. This premium series floor coating kit will cover up to 250-square feet of bare concrete and will dry enough to be driven on in approximately 3-days. When dry, this product creates a clear coating with a high-gloss finish that is designed to be a showroom finish. If desired, users can add their own stain additives to this coating, as long as they follow all of the product’s instructions. Overall, this is a low VOC product that is also low odor and provides a durable high-quality finish that will last a long time. Available in a number of different shades including ivory, slate gray, emerald, and stone gray, this product is sure to match the style of any garage. When applied it creates a professional-grade floor covering that is resistant to oil, antifreeze and is also resistant to abrasions and impacts. It adheres well to not only concrete but also wood and is easy-to-use by just about anyone. The user doesn’t have to acid etch the flooring before applying this product, they simply have to clean it with a degreaser first and then apply the product using a roller. Providing up to 200-square feet, this epoxy floor coating is suitable for use on garage floors, basements, and workshops. It not only provides a semi-gloss finish but also provides resistance to chemicals, impacts, abrasions and even water. Once applied, it will take about a day to dry and about four days before it’s ready for vehicle use. After this time period, however, it will have complete adhesion to the floor surface. This product comes with the two-part solvent-based epoxy, detailed instructions on how to use it and decorative color chips. This product will cover approximately 250-square feet, depending on the number of coats applied, and will dry within 16-hours for foot traffic and about 48-hours for vehicle traffic. This kit consists of a 2-part epoxy floor system, decorative chips, instructions, an instructional video and a concentrated cleaner. While being applied, this product produces low odor and the product can be cleaned up easily with soap and water before it’s dry. When completely dry, it provides a professional looking coating that protects the floor from wear. All of which makes this product suitable for anyone looking to create a showroom quality floor. This high-quality premium floor coating is not only low odor and VOC-free but it also creates a beautiful professional looking floor surface. It’s designed to be twenty times stronger than normal floor epoxy and to have a high-gloss coating that’s sure to impress just about anyone. It can cover approximately 125-square feet, with most garages requiring at least two kits to adequately cover its floor. This kit not only comes with the floor coating but also comes with metallic tint, concrete etcher and instructions on how to use the product. And best of all, once this product is applied, it can be walked on in about 10-hours and able to be driven on within 24-hours.